The Hon. 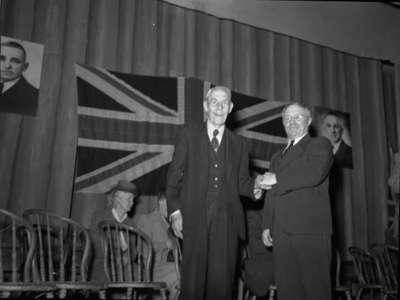 Mr. Gardiner shaking hands with the oldest voter in an Ontario riding. The Hon. Mr. Gardiner is likely to be either Christopher Gardiner or James Garfield Gardiner. The Hon. Mr. Gardiner, M.L.A. and Minister of Agriculture shaking hands with the oldest voter in Ontario Riding, Marjorie Ruddy. Whitby Archives A2013_040_1139.